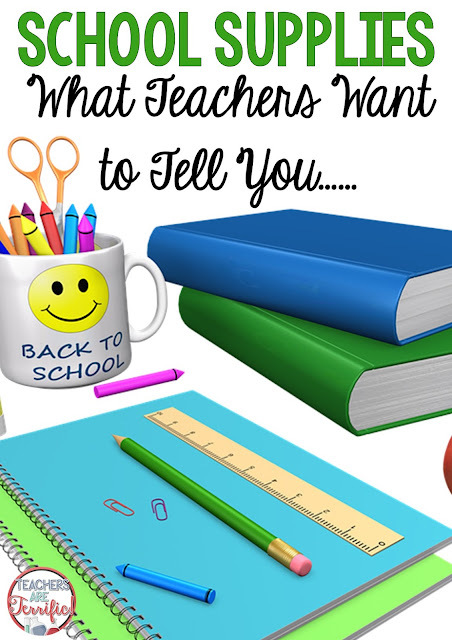 School Supplies - What Teachers Really Want! I was clicking around some sites yesterday searching for a supply of film canisters (which, by the way, are hard to find) and happened upon a blog post. The site I found was all about supplies teachers might need. Most of the items were just things teachers would buy for their own use- like razor blades, rubber bands, and glue guns. But looking over the list I couldn't help but think about my last visit to the Dollar Tree. Mind you, I love the Dollar Tree. But not for school supplies. I watched a mom, with list in hand, picking out things for her child. I wanted to pull her aside and tell her some things, but some people don't take to strangers very well. So, I decided to write a blog post about it. Let's talk about the $1 pencils. They are colorful and have funny things written on them, or Spiderman. But when you sharpen them you will find that the colorful covering is paper and it will fray and peel off. Teachers really want you to buy the YELLOW pencils. And, if you could, please sharpen them at home and send them ready to go. If this is on your school supply list, wait for a sale. Wal-mart and Target have these for 50 cents all the time. Walgreens has them for 25 cents sometimes. Staples had them for 10 cents!! !Those places have them with colorful covers. At the Dollar Tree they are always black and they cost $1. but the real reason to get the plain ones is this: Not every child is going to come in with the fancy ones covered with My Little Pony and the matching bookmarks. It really is better if the notebooks are mostly the same. In my third grade classroom we used these all the time- for graphs, maps, small diagrams, note-taking, coloring. I have so many it takes two plastic school boxes to hold them. I don't let kids use my personal stash, unless they need the gold or silver colors. You can buy a set at the dollar store. They are pretty worthless. The coloring part will not stay sharp. It's waxy and won't color the same. The box only has 12 colors and it's $1. Again, watch for a sale. You can get a box of 12 at WM for 77 cents. That's the good brand- Rose-Art and for a little more you can get Crayola. And for about another $2 you can get the box of 24 which is the ideal set to have. It has more colors, like pink and gray! Same as colored pencils. The dollar store box is worthless. The crayons are just different. I watched that mom at the DS the other day loading up on $1 crayons. The good Crayolas were 25 cents that day at WM. Off topic: When you were little did any of you ever have the box with 96 crayons and the little sharpener in the back of the box? Just makes you want to color to have all those choices and those neat little rows. I immediately organized my big box by color. (I was OCD even when little). Anyway, my point about the BIG BOX is this: DON'T buy it. When teachers ask for a box of 24, please get a box of 24. We don't have room for the giant boxes. The giant boxes only cause conflicts because when we color everyone does not have the macaroni and cheese color and they all wait to borrow it from the one kid that does. Get the box of 24 on sale for 25 cents if that is the size the teacher has requested. If your child wants the larger box, go ahead and get one- just get the smaller box to send to school. That's a win-win! The lead gets squashed by their feet and ground into the floor. Just regular old yellow pencils. Moms and dads, those sparkly pencils covered with glitter with ribbons tied around the eraser are truly beautiful. But the glitter falls off onto their papers and desks. The ribbon unravels. Plain yellow pencils- pre-sharpened- are so much better. I promise. Now, mind you, I did allow a mechanical pencil for one very special occasion. In my third grade class this was called : THE DAY WE START WRITING IN CURSIVE! Again, get those mechanicals for use at home, but at school, I promise, they are only trouble! Oh the choices are so delicious. Target has gorgeous binders with soft pretty colors and I LOVE them. I even bought one and then found it had no inside pocket or insert-able plastic cover. The $1 store might have the right binder with pockets and maybe even the insert covering. Get the size that is listed on the supply list. I promise , that size is on the list for a reason. It's all about space! This was a good idea for about 15 minutes and may still work for upper level kids. But in my elementary classroom this monstrous thing would not even fit in desks- it took fifteen minutes to unzip- things do not fit inside it the way we needed- the zippers got stuck-ughghghghghgh! Get exactly what is on the list. Don't get a larger notebook cause it's on sale. There is probably a reason the teacher wants a small one. Shop the sales. You will save more money that way than being fooled by the $1 store. If you can afford it, buy a few extra folders and notebooks and pencils. Send them in a separate bag on the first day with a note letting the teacher know the stuff is for a child that didn't have what they needed. It happens. Do you any more hints we all need to know about? Loved all your funnies! I had a little child in Kinder Camp tell me wait she needed to tie her show before we could do our morning song. We are all waiting, standing, ready to dance around. She finally finishes, and in a loud voice looking down at her shoe she announces, "Boy I tied that crappy". It was all I could do to keep from cracking up. Which of course lead to a discussion of there are things we cannot say in class...lol. I totally agree with all your BTS supply shopping tips. Thanks for sharing! What a great post! I would love to be able to have my parents read this. So many parents think they are helping by buying the bigger and the better items when it's not always the case (those Trapper Keepers are not good for upper elem. either, I know!). One item that I would add to my list of no, no supplies is colored looseleaf paper... sigh! Same scenario as you described with the big box of crayons. I love it when kids so confidently correct each other incorrectly - always makes me smile (and sigh...)! You are so funny! This post was great. I love the supplies suggestions. Those big bulky binders are bad for upper grades too! I will have to start a file for my funnies because I forget so easily and reading yours made me laugh out loud for reals! Every word of this is so very true. Thanks for the laughs and sweet memories! Five Random Things to Think About!